Love it and hope my daughter in law loves it too as it is for her birthday. 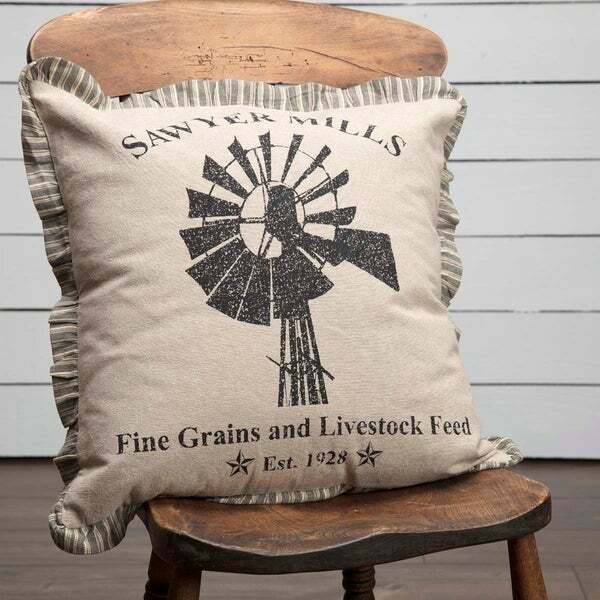 The 18x18 Sawyer Mill Windmill Pillow brings a Farmhouse anywhere it is displayed. With the black stenciling giving it a vintage feel, this all-cotton pillow is a khaki chambray and trimmed with a 1" charcoal grey, chocolate, and creme striped gathered ruffle and reverses to solid khaki chambray with 2 tie closures. Dimensions 18.0 In. X 18.0 In. X 5.5 In. I really like this pillow. it is fun and fits in well with any country/primitive décor. It is soft and looks like it will be easy to remove and wash using the ties in the back of the pillow. Cute pillow ! 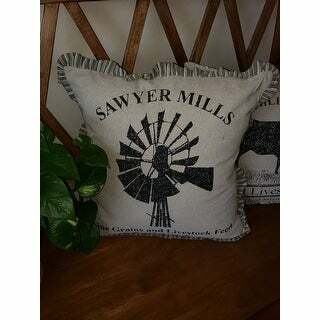 Matches other Sawyer Mills pillows I got for my farmhouse living room. Lightweight fabric and poly filler. Cute ticking ruffle around edges. Received on time. Great quality pillow for a farmhouse/rustic decor. Pillow itself is really full, not skimpy. You can remove the cover to wash as well which is a big PLUS! We have a farmhouse with red leather furniture. Color, size and quality is what we were hoping for!!! We love it. purchased two other pillows with it can't wait to get them. We love this decorative pillow for our brown leather couch. It is very simple and goes beautifully with our farmhouse style. Love the stripe detail on the edges of this pillow. I love this pillow! It is the perfect size. The print is better in person than in the picture. I would definitely recommend this pillow! I loved this product . Love the design and wording on this pillow . Made a great addition. I would defiantly recommend this seller and this brand . Couldn’t find anything like this anywhere else! Bought with quilt, shams, and a bed skirt. Love this collection. Great colors. I bought this pillow along with 3 others and they were exactly what I was looking for to use in my living room. My home has a lot of rustic/farmhouse decor. I definitely recommend, great quality. I am so happy with this purchase. 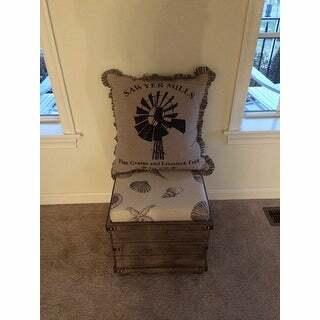 This looks great in my Farmhouse themed living/ dining room. It matched perfect. It is a very good quality. Also the burlap material is soft and not scratchy. Very nice quality pillow and looks great anywhere I put it! Print is great quality and I just love the little fringe around it. Great touch! Love! Very cute pillow. As pictured. Just what we wanted for our living room! Looks great in my Safavieh rocker! love it! Very nice looking pillow. Well worth the price! I love any kind of country motif and this is a great combination of country and shabby chic. I liked the farmhouse feel it would bring into my master bedroom with the windmill.